Yesterday, I got the sweetest surprise in the mail! Doli Miss Bows! I was not expecting her, and my husband swears he was not behind it. I'm not sure who sent her, but THANK YOU SOOOO MUCH! 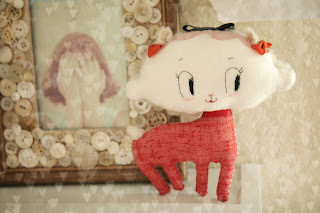 She is absolutely perfect-- definitely one of my most favorite things in my studio! Check out Misako Mimoko and all of her other awesome plushies. She's amazing! 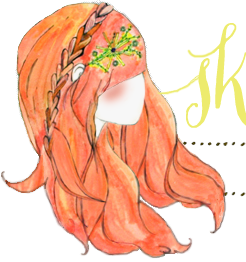 I love Misako's creations ! You mean this was a secret sent ? No card, no gift-tag, nothing ? Mathyld-- I am feeling sooooo lucky! The card just said, "Somebody loves you :)" I couldn't believe my eyes! I'm hoping to find out who it was so I can at least reciprocate! How adorable! You are very lucky indeed! I also wanted to say how much I love the beautiful button frame in the background. Awwww! What a lovely surprise! I think lots of somebodies love you, and for good reason. :) Have a great vackay! happy you got her!! I was afraid she didn't arrive before you left. thank you for posting them! !